Sealed lead acid batteries have long led the charge (so to speak) in the RV market. But lithium batteries are becoming somewhat of a force in offroad applications – particularly from a weight, capacity, more cycles, faster recharge, higher discharge current, and size-to-power perspective. However, lithium is not without its drawbacks – especially the discernment on upfront cost, safety, and limited requirements of the on-road sector. Having said that, the off-grid brigade will spruik lithium as a no-brainer when utilising larger AC loads. And that’s why a growing band of dedicated offroad caravan manufacturers are installing lithium battery setups as standard equipment or offering optional lithium battery upgrades. But do the lithium battery pros outweigh the cons? And if so, why the slow industry uptake on lithium? Here, we conduct a Q&A with two industry experts – David Bayliss (BMPRO) and Ryan Hammond (Sealed Performance Batteries) – on the future of lithium in the RV industry. Lithium: is it the ‘way of the future’? DB: We see lithium batteries as the current ‘way of the future’. There has been so much investment in this battery technology and manufacturing capability that it is hard to see it being replaced in the short term. However, you can never discount the new disruptive energy chemistries being developed by private equity and the university fraternity as the ‘next big thing’. RH: In applications which utilise lithium’s wide range of benefits, lithium certainly is the way of the future. The benefits in many cases already outweigh the extra upfront cost and if the application calls for regular usage the lifetime cost of lithium is much lower than the equivalent Sealed Lead Acid (SLA) option. What are the advantages and disadvantages of lithium batteries? And do the pros outweigh the cons? DB: The key advantages as relates to the RV industry are weight, energy density and longevity. Weight is the obvious advantage coming in at only one-third that of traditional lead acid batteries especially as manufacturers cram more and more modern conveniences into an RV every extra kg is critical. Secondly is the energy density – in the same physical battery size a lithium battery offers a full 100Ah of energy whereas AGM batteries should under normal use only be discharged to 50 per cent of its capacity. Therefore the available energy is only half that of lithium batteries and when combined with the longevity of lithium batteries which can provide between 4-6 times the number of cycles the advantage of the newer technology is substantive. The major impediment in seeing a mass rollout of lithium batteries is the cost which is still around 3-4 times that of AGMs. RH: There are many advantages of lithium batteries over SLA. Less than half the weight. Great use of the available capacity – can use all of the capacity of lithium versus 50 per cent (recommended) in SLA. Larger number of cycles – lithium can be cycled up to around 2000 times at 100 per cent DoD vs SLA at about 300. Flat discharge curve – means more efficient use of the available capacity and therefore longer runtime. As well as the output voltage holding above 12V for much longer being better for most electronic devices. Can be left without a charge for longer without being permanently damaged. Can be recharged a lot faster than SLA. At times limited max discharge current. If the application requires any of the above advantages that lithium delivers then the extra upfront costs are certainly worth it as in the long run they will actually save you money. The BMPRO SENTRY lithium range has been IEC62619 certified as a complete battery system in order to provide piece of mind for any of those perceived safety concerns. Could you provide some thoughts on the Lithium vs AGM debate? DB: The debate between lithium and AGM batteries is a relatively simple one – the lithium is a new technology battery that is superior but not well understood and comparatively expensive compared to a AGM batteries which are proven, cheaper but substantially less efficient. RH: This really comes down to the application. 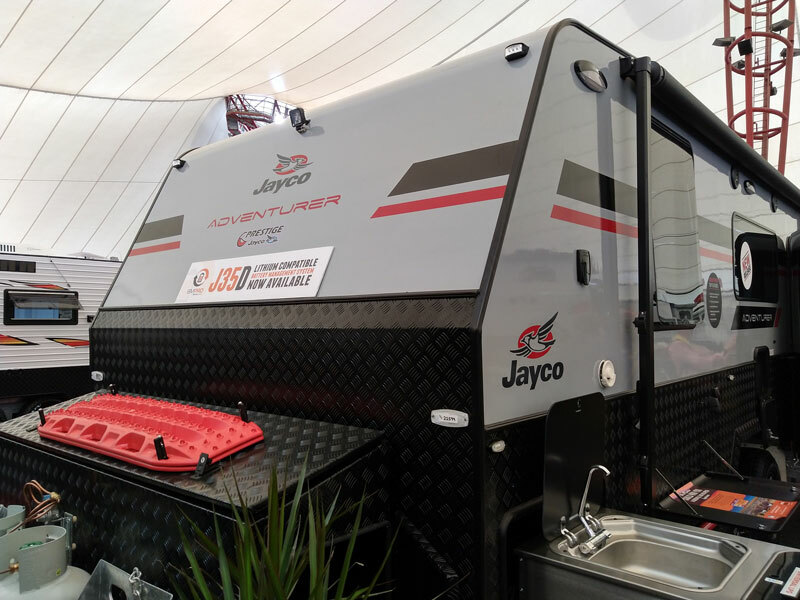 As mentioned above if the application utilises any of the above advantages, of which caravanning would utilise all of the above advantages, then the lithium option far outperforms the AGM (SLA) alternative. If, however, the batteries are only used rarely and weight, recharge time and run time etc. is not an issue then AGM makes more commercial sense. The IEC62619 complete battery system certification which the BMPRO SENTRY lithium range has should allay any concerns regarding safety, but as a general rule this certification is not common place with lithium batteries in the SLA replacement space. What’s your assessment on the industry take-up of lithium? DB: Cautious – everyone has heard the horror stories of lithium batteries which have had issues in planes and in phones. The technology used in 12V LiFePO4 (lithium) batteries is inherently safer but to date these batteries are not well understood. RH: The uptake of lithium is increasing across most industries and will continue to increase. We see consumers becoming more comfortable with the safety aspects of lithium batteries (in particular ours given the IEC62619 certification), and beginning to understand the superior performance and life cycle of the batteries as a major advantage against other chemistries. We have been involved in many changeovers in both industrial and consumer applications, all of which are leaving the customer with a much better result. Do you concur with the ‘school of thought’ that the lithium battery price will drop by 50 per cent in the next five years? DB: Not sure on the exact numbers, but you would have to expect that as demand increases and manufacturing improves its efficiency there will be a substantial drop in price. However, when you do the sums now on the total available energy available from a lithium battery over its lifetime it is already is a cheaper option. RH: No, not necessarily. I think that as the supply side grows there will be price reductions over the next five years, but I’m not sure if those reductions will be in the order of 50 per cent. Does the price of lithium justify the additional benefit? DB: This is really up to the customer. If your camping is primarily restricted to caravan parks AGM batteries are the simplest, cheapest and most convenient energy storage model. Want to get offroad and explore? Lithium is the only way! RH: In applications which utilise the benefits as mentioned above, the lithium option will in fact be the lower cost option over the life of the battery. The small overall impact the caravan industry will have is not enough to force any significant change in price? DB: Correct – it will need to be driven by automotive or another larger scale industry to reduce the price. RH: The caravan industry alone will not be large enough to force a significant price reduction across all industries. Is there a growing percentage of caravanners now opting for the benefits of lithium? DB: It is still in the “early adopters” stage but we are definitely now seeing manufacturers start to offer customers the ‘upgrade’ option of lithium batteries. RH: Yes, we get enquiries from caravanners regularly and this interest base is only increasing. Why not just use solar power? DB: Solar power is not a storage option – it is only a generator and the energy must be stored somewhere. It is also extremely variable in its output due to clouds passing over and ensuring the right angle to the sun to maximise energy output. RH: Solar power, without batteries, can only be used when the sun is shining, so this isn’t an option at night or on cloudy days. Batteries are critical in order to have power available when required, while solar is good for charging the batteries. I also asked David Bayliss how lithium was being integrated into the BMPRO model, and whether a complete system was being offered. “The BMPRO system now comes complete with a lithium offering as we have just released our lithium BMPRO Sentry batteries which have been extensively tested and proven to perform with the BMPRO Power Management Systems. This is a LiFePO4 battery available in 100Ah and 125Ah,” he said. Sealed Performance Batteries (SPB) is an Australian-owned battery and energy storage wholesale distributor. SPB has been around for over 20 years and have extensive experience in a wide range of battery technology including lithium batteries across a number of chemistries and voltages, along with traditional automotive starter batteries – AGM and GEL deep cycle as well as UPS and standby batteries. BMPRO SENTRY lithium range has been specifically tailored for deep cycle applications in 12V and 24V variants and is perfect for Sealed Lead Acid (SLA) replacement. It is unique in the industry, with IEC62619 certification for the complete battery system (as opposed to just the cells) along with Bluetooth options for simple monitoring and diagnostics. Will BatteryPlus35SR be compatible with Lithium batteries.i.e. will this charger charge a Lithium battery? Thank you for your question. The battery management system compatible with lithium batteries is BatteryPlus35HA, which has a different charging profile for LiFePO4 batteries. Hi Scott, the only model of J35 compatible with lithium batteries is J35D.